Lina Kostenko (Лі́на Косте́нко, 1930) is actively present in the Ukrainian literature for more than 50 years. She is mostly known as a poet, but she has recently become an active publicist as well as a talented prose-writer. 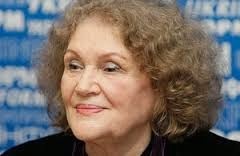 In 2010, at the age of 80, she published her first big prosaic work, the novel "Notes by the Ukrainian Lunatic" (Записки українського самашедшого) that immediately became a best-seller among Ukrainian books in 2011. The novel is extremely truthful and emotional, but without unnecessary pathos and sentimentality. It presents an account of the everyday life and spiritual atmosphere in Ukraine in the times of L. Kuchma and the Orange Revolution. The novel is filled with nostalgic allusions to Gogol and Bulgakov. From the point of view of genre and style the novel is a dense combination of fiction, diary, "modern chronicle" and keen publicism. Essentially, it is an extremely talented, unique chronicle of an intelligent's soul in the times of chaos on the background of today's political and spiritual absurdity both in Ukraine and worldwide. Podarilo sa mi nájsť Ukrajinské zhudobnené romantiky na poéziu tejto autorky. Hudba bola robená od autorov ako L.Telnyuk,O.Bohomolets,Olena Karpenko...Odporúčam si vypočuť aspon jednu ukážku. In the former Kostenko depicts the tragic fate of a semilegendary figure in Ukrainian history against the background of the Cossack-Polish War, while the latter deals with the fateful Battle of Berestechko from the same historical period. Vo svojom diele Berestechko,opisuje Lina Kostenko udalosti bojov, odohraných v roku 1651,v meste Berestechko vo Volhynia. Podarilo sa mi nájsť video,kde sú fotografie odohraných bojov. Zaujimavý pohľad do minulosti týchto miest,kde sa kedysi bojovalo určite zaujme aj Vás. Dočítal som sa,že na Ukrajine sa dodnes beseduje ohľadom tejto bitky. This is the first prose novel by Lina Kostenko and her first new book for the last 20 years. The book was presented by Ivan Malkovych and Lina Kostenko.On the eve of St. Nicholas Day, ”Diary of a Ukrainian Madman” by Lina Kostenko, one of the most anticipated books in the Ukrainian literature was presented. "to correlate Ukraine with the world, a human being with Ukraine and with the world”. “This is not a “chicklit”. This is a surrealistic Babylon of the contemporary world,” she said. Tento príspevok som si vybral preto,lebo si myslím že už v r.2010 sa Lina Kostenko zaoberala problémom Ukrajiny,v ktorom sa nachádza dnes. Chcela vytvoriť prepojenie Ukrajiny a sveta,"to correlate Ukraine with the world" Myslím,že predpokladala čo bude nasledovať. She says: “No human being or living creature deserves to be killed or eliminated. His destiny cannot be solved here, on earth”. Vďaka tomuto výroku,bola Lina Kostenko nominovaná na Nobel Peace Price 2005,resp.She is one of the 1000 women proposed for the Nobel Peace Price 2005. It is planned that... Poetess Lina Kostenko starts all-Ukrainian tour on January 25. According to the web site of “A-BA-BA-GA-LA-MA-GA” publishing house, there will be 7 readings within the framework of the tour. It is planned that L. Kostenko will meet with readers in Rivne city on January 25. Inhabitants and guests of Kyiv will have a possibility to communicate with the poetess on January 31. It is planned that meeting with L. Kostenko will take place in Kharkiv city on February 7. It is planned that meeting with L. Kostenko will take place in Lviv city on February 14-15. The last meeting of the tour of L. Kostenko with readers will take place on Ostrog city on February 16. Ďalšia z jej konferencií sa konala pri príležitosti jej životného jubilea. Získal som video z tejto konferencie. Kto sa započúva bližšie,rozpráva o prezentácii knižky,ale aj o prezentácii bytia ľudí.Ako som už spomínal,už dávnejšie sa vyjadrovala k Ukrajinskej kríze,ktorá ako vidíme napokon nastala. Myslím si,že aj v pokročilom veku,stále uvažuje racionálne a správne. "It's true. Those who have wings don't need the ground. If there is no land, there will be sky." More of this poem you can watch in the video performed by Bogdan Stupka. Виступ Ліни Костенко в Харковe. Lina Kostenko isn’t just a great poet, but a real moral authority. For me and millions of Ukrainians you are not just a great poet, but a real moral authority, someone who even during Soviet times could be free, wasn’t afraid of standing up to the authorities, spoke in defense of Ukraine. I know that you don’t like praise, but believe me, your talent and courage are worthy of a bow. Lina Kostenko's 'Notes by the Ukrainian Lunatic' a leader of Facebook's reader's vote. Topping the list of TOP100 Ukrainian books is Lina Kostenko with 'Notes by the Ukrainian Lunatic'. Богдан Ступка, вірш Ліни Костенко "Крила"
Мульт створено спеціально для заходу "Лна. Інша акустика", що відбувся 2 квітня 2010 року в Запоріжжя і був присвячений ювілею Ліни Василівни Костенко. Організатор концерту творча група "Своєрідне Коло"
Моя любове! Я перед тобою. Бери мене в свої блаженні сни. Чудовий переклад геніального вірша. Обожнюю пані Ліну. Вона чудова. The name Kostenko has a web popularity of 4,160,000 pages. Famous Ukrainians of all times. The most outstanding Ukrainians of all times are believed to be Taras Shevchenko, Lesya Ukrainka and Bohdan Khmelnytsky.Lina Kostenko wasn't in the top ten,wasn't in the top twenty,BUT WAS IN THE TOP THIRTY PEOPLE called the best of the best ! The presentation took place in Ukrainian House in Kyiv 22.03.10, a few days after Lina Kostenko’s 80th birthday. Lina Kostenko announced that she decided to return to literary and public activity after many years of silence. Who's Who of the Golden Writers of Ukraine? Together, we will celebrate this group of famous writers who have print runs of over 100,000, have been translated into other languages, have the highest respect of readers—and the media's eye. There are many people whose hearts are warmed by the knowledge that Lina Kostenko lives and works in Kyiv. Lina Kostenko outraged over circumstances of Yulia Tymoshenko’s transfer to prison. “I was born in the same year as Charlie Chaplin, Tolstoy’s Kreutzer Sonata, the Eiffel Tower, and Eliot, I think,” Anna Akhmatova wrote in one of her autobiographical notes. музика О. Спаринського виконує Галина Довбецька. Музично-документальний відео-нарис. I am happy to be able to communicate with Lina Kostenko. I have lived a long life, but I am always learning from her. I am learning to understand people, the stylistics of conduct in communication. She is my spiritual tuning fork. Красивое стихотворение Лины Костенко "Осінь жагуча"
устали руки в пламени ночей. лежит у лета осень на плече. Уже дозрела чувство до изхода. И пышет жар на томности крыле. всего живого на живой земле. идёт – аж прогибаютця ланы. спят яблоки, и раса жёлтых груш. Рвёт синий ветер белые постромики. А в сердце лета – щедрый солнцепад. Лич загустеет в гроздьях перегретых. зимою бродит в молодом вине. По случаю 85-летия выдающейся украинской поэтессы Лины Костенко Киевская городская организация партии « ВО« Батькивщина » решила подарить школам и библиотекам города 85 комплектов её книг. Пусть художественное слово Лины Костенко прорастает в душах детей той безграничной любовью к Украине, которой наполнено всё её творчество! … Бо хто за що, а ми за незалежність. (... Ибо кто за что, а мы за независимость. Поэтому нам так и трудно из-за того.